FIGURE1 ■ Options for selection of port sizes and location in laparoscopic enterocystoplasty procedures. Source: Courtesy of the Cleveland Clinic Foundation. 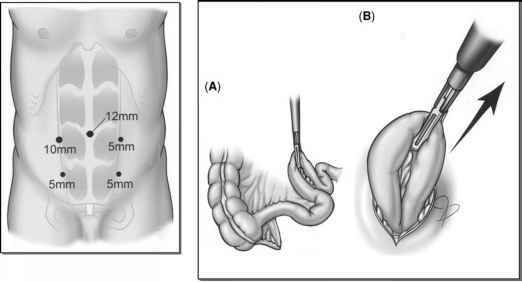 FIGURE2 ■ Extracorporeal isolation (A) and manipulation of the small bowel (B) via the umbilical port site. Source: Courtesy of the Cleveland Clinic Foundation. Bowel continuity is re-established using traditional open techniques and the mesenteric window is closed. The bowel anastomosis is performed cephalad to the excluded segment of bowel, and the reanastomosed bowel is returned to the abdominal cavity before any further manipulations are performed. This step reduces the potential need to enlarge the circumumbilical incision for re-introduction of an edematous combination of both the bowel reanastomosis and the reconfigured bowel segment for augmentation. FIGURE 3 ■ Selection of port sizes and location for laparoscopic sigmoidocystoplasty. Source: Courtesy of the Cleveland Clinic Foundation. 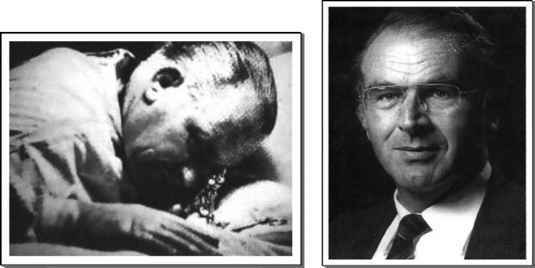 FIGURE 4 ■ Detubularization and reconfiguration of the isolated bowel segment. Source: Courtesy of the Cleveland Clinic Foundation. circumumbilically and extended inferiorly in obese patients for an additional 2 cm. The preselected loop of bowel is delivered extracoporeal through this incision. 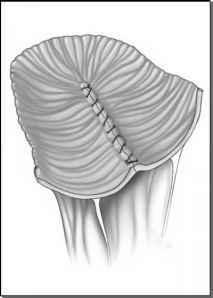 Care is taken to prevent any twisting of the mesenteric pedicle and to ensure proper proximal-distal orientation of the loop. Using traditional open surgical techniques, the 20-cm bowel segment with its vascular pedicle is divided between bowel clamps and isolated as in ileocystoplasty.